The PAC Under 11 girls team. From the left are Fearne Starr, Jaia Bull, Harriet Smith and Eliza Mardon. Led by Amittai Ben-Israel’s second place in the under 20 championships the senior men picked up a team bronze. The six-man team were led home by James Whitehead in a brilliant 8th place (37:04) and he was followed by Ben-Israel 20th (38:24), Danny Snipe 21st (39:01), debutant Simon Mead 22nd (39:05), Stuart Haw 24th (39:19) and Jon Peet 37th (40:56) for team bronze. 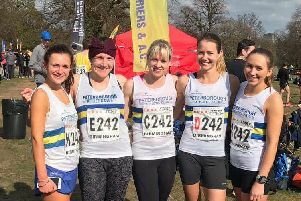 Whitehead and Ben-Israel also earned themselves a team place in the Cambs squad to compete in the Inter-Counties Championships at Loughborough later in the season. The other individual medal came in the first race of the day for under 11 girls. Ten-year-old Eliza Mardon ran a well-judged race to finish third (7:09) and hold off local rival Norah Brill of Nene Valley Harriers. Mardon was supported by Harriet Smith in 13th (7:48) and Jaia Bull 18th (8:00) which was enough to secure the team a silver medal. Also running in this race was eight-year-old Fearne Starr who finished in 23rd place in 8:17. Not to be out done by the girls, the under-11 boys also won team silver, led home by Benji Fairclough in 4th (6:53), Jack Bull in 6th (7:03) and Oliver Barden in 9th (7:06). Also competing in this age group was Callum Shaw in 17th (7:22). Another team medal came the way of the under 17 men, this time it was a bronze medal. Training partners Luis Turner and Nathan Copland battled it out and ran stride for stride throughout the 5.8k circuit to finish in 14th and 15th places respectively. Joining them on the medal rostrum was Ben Papworth, who was competing in his first ever cross-country race, in 20th. Also competing in this age group was Dominic Fitzharris, who finished in 21st place in 23:49. Peterborough AC’s Ben Heron and Wendy Perkins flew the club flag in the Lincolnshire Cross-Country Championships held at a wet and muddy Louth. Heron finished a highly creditable 6th in the senior men’s race while Perkins was 5th veteran lady home.